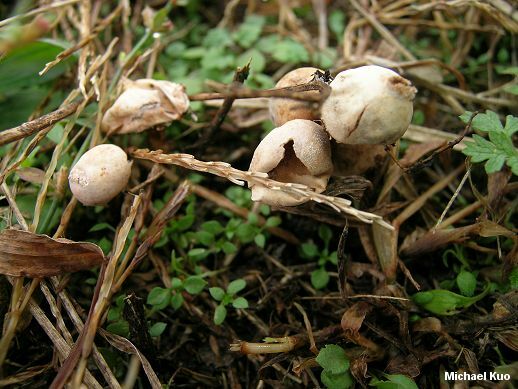 Among the species of Tulostoma that are not usually found in sandy soil or in deserts, Tulostoma lloydii is an eastern North American species, distinct in having smooth spores, a mouth that is not tubular, and a membranous outer skin (which quickly sloughs away). 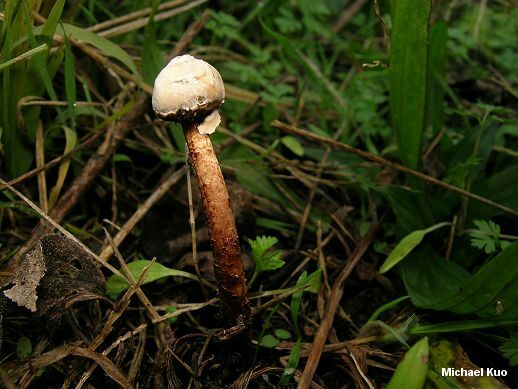 Ecology: Presumably saprobic; growing alone, scattered, or gregariously in woods, or in waste places with woody debris and plant debris; summer and fall; east of the Great Plains. 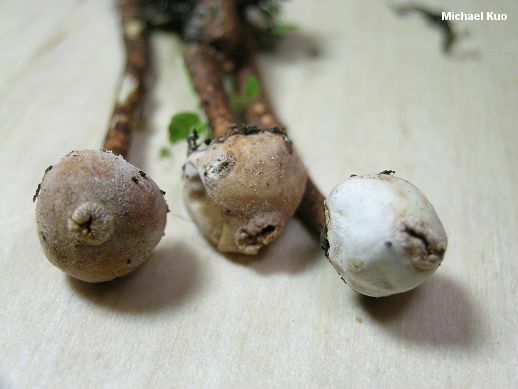 Spore Case: 6-10 mm across; more or less round, with a flattened bottom when mature; outer skin dark, quickly sloughing away to reveal the paler, paper-like inner skin; underside socket-like and flattened, usually displaying the darker remains of the outer skin; developing a more or less apical, finely hairy opening that is initially surrounded by a somewhat raised area. Spore Mass: Yellowish, becoming cinnamon brown and powdery with maturity. 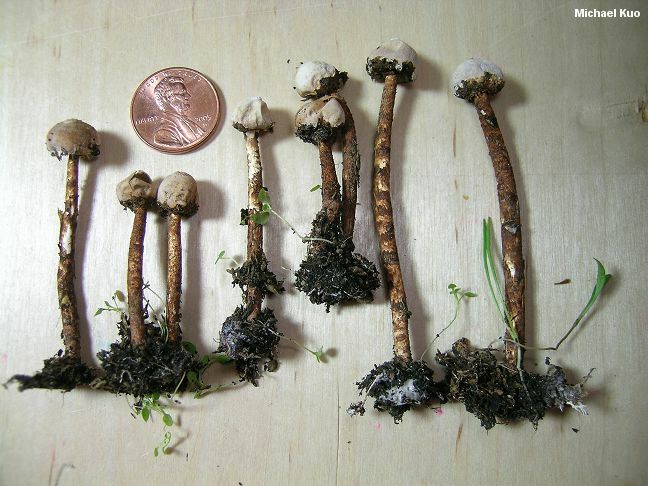 Stem: 5-8 cm long and 2-4 mm thick; tough; dark brown to reddish brown; the surface breaking up into patches and zones as the stem grows; more or less equal above a bulbous base. Microscopic Features: Spores 3.5-5 x 3.5-4 µ; subglobose to broadly elliptical or sublacrymoid; smooth; ochraceous in KOH; often with a prominent apiculus. Capillitial threads hyaline to ochraceous in KOH; 3.5-11 µ wide; walls often thickened; often encrusted. REFERENCES: Bresadola, 1904. (Saccardo, 1912; Coker & Couch, 1928/1974; Long, 1946; Wright, 1987.) Herb. Kuo 10220901, 10230901.